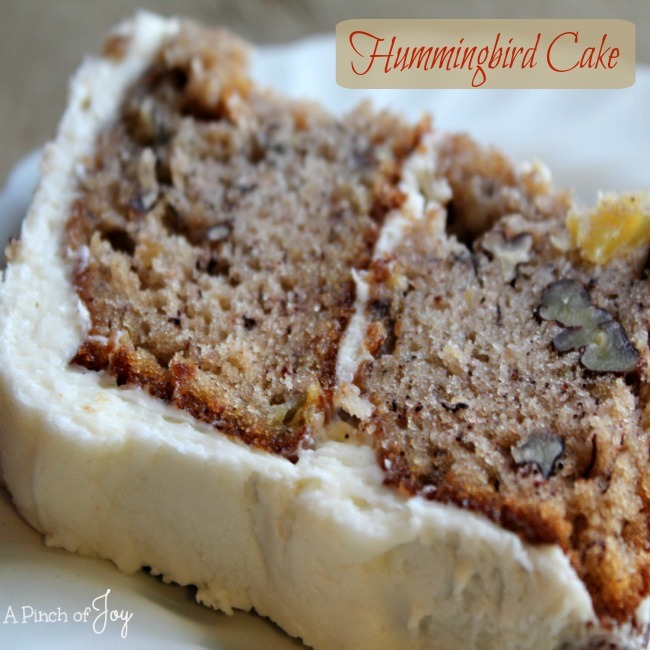 I’ve heard of Hummingbird Cake forever and wondered what it was. I pictured something light and fluffy, fruity and sweet to taste. You know – hummingbird like! So I jumped at the chance to make one when my friend Donna shared a Hummingbird Cake recipe. Be sure to use overripe bananas since they are sweeter. Mashing them releases more of the ripe banana flavor. Mash bananas with a fork in a small bowl or in the two cup measure. It will take about 4 bananas to make two cups. Don’t drain the pineapple. You can substitute chopped walnuts for the pecans (or use coconut instead if there is nut allergy to worry about). A 9×13 pan will work, but I’d recommend using the layer pans. I used a 9×13 pan as it is the only one available at the moment and it took about 45 minutes for the center to test done. Even then it was a little gooey to eat. I cut in half to make a layer cake. A good cream cheese frosting is traditional. I wasn’t sure how to embellish the cake so I just used a row of pecan halves along the bottom. Next time –and there will be a next time– I will chop extra pecans and press them into the sides of the frosted cake. I’ll also try about half a teaspoon of nutmeg along with the cinnamon. Delicious cake and gets even better if you can resist eating it all in the first day or two! Dense, moist oh-so-good cake with banana, pineapple and nuts! Combine dry ingredients, gently mixing with whisk. Add remaining ingredients and mix until all ingredients are well moistened. Do not over mix. Spray 3 9 inch cake pans or two 8x8 square pans. Divide cake mixture evenly between pans. Bake 25-35 minutes until cake is done in center. When done, a toothpick inserted in the middle will come out clean. Cool fifteen minutes before removing from pan to rack. When completely cool, frost with cream cheese frosting.